artist kevin cyr built this pedal-powered camper for one in april 2008. the camper sits on a modified bike frame with two back wheel and one up front. 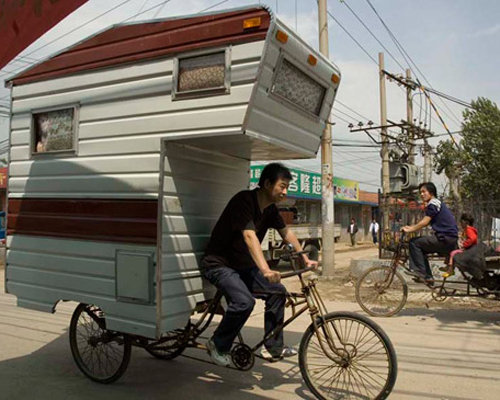 the rider sits on the bike and can pedal around, moving the camper from place to place. inside the camper features all the amenities needed in a small and compact envelope. the sculptural piece also became a subject in many of cyr’s paintings. the design is perfect for a solo holiday and will definetly turn some heads along the way. Better stay put on a windy day. Nice though! How does it handle off road? Is there some kind of handbrake on this thing? I don’t think I would get much sleep in it if not, I would be worried about rolling off into traffic! This is…amazing! I need one now! GREAT!!! Phantastic Idea! I love it. Would like to get one. Guess it is more to be used in a flat area with no wind. its really or is a render?? wow excellent work. There should be a versatile mobile club that units in the virtual or in the flesh. It can be built with pieces of PVC liner(ceiling)? And how is the internal structure? I would like to receive the carrier’s plan to install it on a 125cc motorcycle. Who can help me? Thanks. I know this guy – he’s a great thinker and a nice guy. A really good artist. I would like see it inside! Putting the world in abox!! however I prefer there’s a bed inside the camper bike!